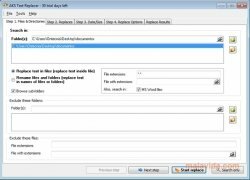 AKS Text Replacer is a simple application that allows the possibility to search for the words that you indicate in various documents and substitutes them with others. You can indicate a folder with multiple documents and AKS Text Replacer will search for the words and it replaces them automatically. If you had to do these changes manually you would take ages and it would suppose a great effort. With AKG Text Replacer it will only take you a few seconds. The first step that you have to take is to select the folder where the document or documents that you want to revise can be found. In this step, AKS Text Replacer allows the possibility to change the names of the files and substitute them for others. After that, you only have to write the words that the application has to find and the words that will substitute them. AKS Text Replacer also allows the possibility to include filters in the searches, like for example, only to look for files with a specific size, or that were created on a specific date. It is advisable that you create a backup copy of the original files before you start replacing the text, in case there are any errors. Once you have chosen the configurations, AKS Text Replacer will search for the words and you will only have to confirm if you want to replace them. When it is done it will show you a report with all the changes. Save a lot of time with AKS Text Replacer, and automate the search and replace task. The trial period only lasts for 30 days.